We return to Dandeville and catch up with our little eco-guinea pig, Christopher Nibble. This time Christopher is on a mission to reduce waste as he recycles materials in all sorts of creative ways, to the delight of his friends and neighbours. Christopher Nibble loves his recycled bicycle! Mr Nibble has repaired and repainted it all so beautifully and Mrs Nibble has turned one of her old dresses into some very useful saddlebags. It really looks a treat. Now Christopher is the greenest guinea pig in Dandeville. He's ready to rescue the town's rubbish, turning old into new, in this story full of pedal power! 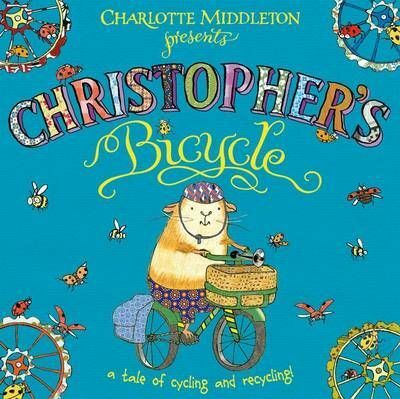 Inspired by his own recycled bicycle, Christopher asks Miss Borrower in the library, Mr Rosetti at the cafe, and Madame Choux from the bakery if he can take what they are throwing away. Then, with the help of his sister Poppy and their friend Posie, Christopher sets about making things out of old newspapers, empty coffee jars, and stale bread. Christopher gets on his bike to deliver the results around the town and so in turn inspires the other guinea pigs in Dandeville to start recycling. The story ends with the great Dandeville Recycling Race where contestants turn up with all sorts of wheeled contraptions made out of old prams, wheelbarrows, and even skateboards. Will Christopher show that two wheels are best and win the day?